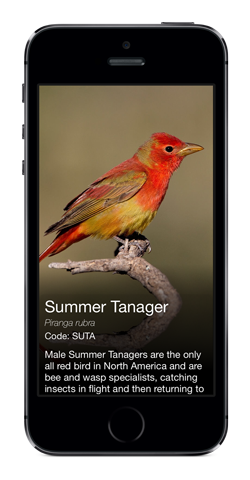 Daily Bird is a fun and gorgeous photo-a-app designed for iPhone and iPod touch that teaches you about a new bird every single day. Check in every day to see a stunning new photograph, learn new facts and hear interesting stories from the photographers who took them. Set this up on your desk to keep grounded during a rough day stuck in the office when you would rather be outside. Start off your day by learning something new and enjoying beautiful bird photography. Come back for a new photo every day and a new chance to guess the species of the day. Share your guess with your friends on Facebook or Twitter. What a fun treat to look forward to each day! I especially like the ability to click to the Ebird map to see actual recent sightings. My most beautiful and prized app. 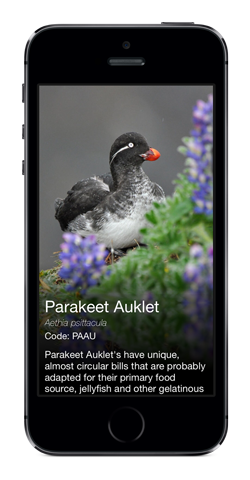 I have this app for many months now and find it exceedingly beautiful – never crashed, simple and a pleasure to use, interesting facts about the birds every day and stunning photos. Thank you for this gem! I love this app. I always have to squint to see what day it is; not anymore!I just push the app and BAM big as day time, day, month, and a bird, a new bird. I absolutely love it! Great job! And top it off if you click on the bird its info comes up, plus for the photographer in me Canon EOS 7D 100-400 f4-5.6 L IS it includes aperture and focal length AND which camera!!! Awesome! I look forward to this every morning, or if I forget for a few days it’s like Christmas when I remember (this is probably more of a sad review of my life, but let’s pretend not). Great mix of North American and international birds. I would love to see a few more photos of tricky females and juveniles thrown in! I always challenge myself (and then my girlfriend) to ID the bird before clicking to see the description (whoever writes those is doing amazing work). Even if I have never seen or heard of the bird, it is fun to see if I can get close on taxonomy and learn something new. You can add your own photos to the BirdsEye galleries at http://birdseye.photo where the Daily Bird photo is selected from.